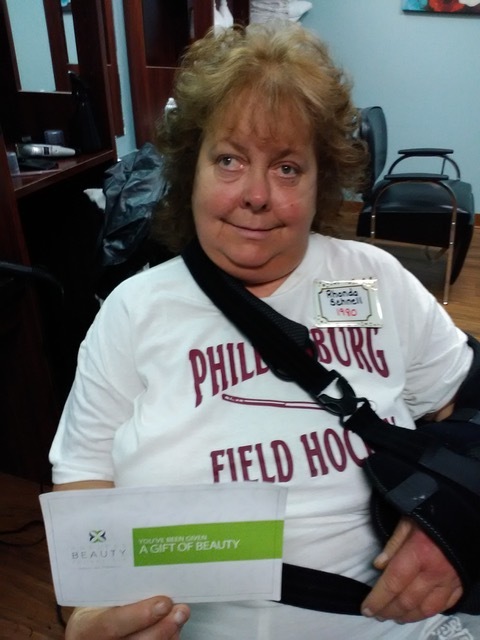 Ageless Beauty Foundation is proud to announce that Rhonda Schnell, a resident of Brakeley Park Center in Phillipsburg, NJ, has received the Foundation’s “Gift of Beauty” award. The Ageless Beauty Foundation helps provide salon, spa and barber services to senior living residents in New Jersey, Florida, Ohio, Rhode Island and New Hampshire who are experiencing financial hardship and who may not have anyone contributing to the cost of their personal care. The Ageless Beauty Foundation is a non-profit organization which was created to help seniors feel beautiful, which in turn makes one feel good, no matter the age, no matter the state of health. Unfortunately, many living in senior living communities have outlived their resources and no longer have the means to pay for salon services. The Ageless Beauty Foundation has made it its mission to provide senior living residents in need with the gift of beauty. The Ageless Beauty Foundation accepts nominations from friends, staff members, physicians, caregivers, etc. The Foundation has a board in place that reviews and approves all nominations. Once approved, the nominated resident will receive a gift card letting them know they have received a special Gift of Beauty from a friend.